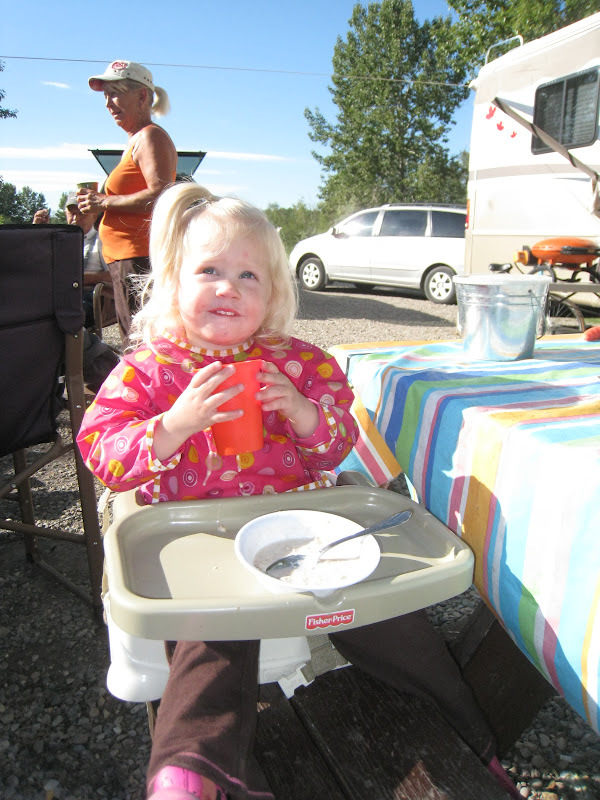 Continuing with my series on Family Camping Made easy, I now bring you - camping with toddlers and preschoolers. To read the first two stories in the series, click on the following links for Warm sleepers are happy sleepers and Baby Adventures. We are in full on preschooler mode right now with a three year old who loves the outdoors. Most of the suggestions below come from our own adventures camping with our son. Friends have also been generous with additional advice that I'll share. If you have older children, many of the following suggestions will be practical for you as well. Bring a sand pail, shovel, and toy cars/dump trucks/diggers, etc. - no more toys needed. Seriously, toddlers can play with these toys in the sand, dirt, water, mud, rocks, with leaves, pine needles, or wood chips. It's the simplest solution for entertainment when camping. We went on a two week camping trip last summer with nothing else other than a pail, shovel and toy truck. We also brought a few books and the portable DVD player for down time but that was it. Never did we wish we had brought more toys. Most children 3+ will enjoy being able to explore the campground with their friends and family on some kind of bike or ride-on object. We just got our son a Strider bike and are very excited to watch him learn to ride it this summer. Little balls, big balls - any kind of ball! Those are just some suggestions. Go down to your local toy store or department store and look around - there's tons of fun stuff for kids. We have a set of foam bath letters and numbers that we like to use for scavenger hunts. Check out the story I wrote on our ABC Scavenger Hunt. Another idea I got while surfing Pinterest one day was to take animal figurines outside. Every family usually has a collection of plastic animals so why not take them outside to climb trees, logs, and play in the sand. We aren't a very crafty family so I can't offer many suggestions here but the simplest idea I see pop up on blogs all the time is to take the kids out on a nature hike with a bag for collecting interesting items they find. When you return to camp, have the kids glue their items on a piece of construction or poster paper. When they go home, they will have a souvenir from this camping trip. Preschoolers and school aged children will love playing card games and board games while camping. 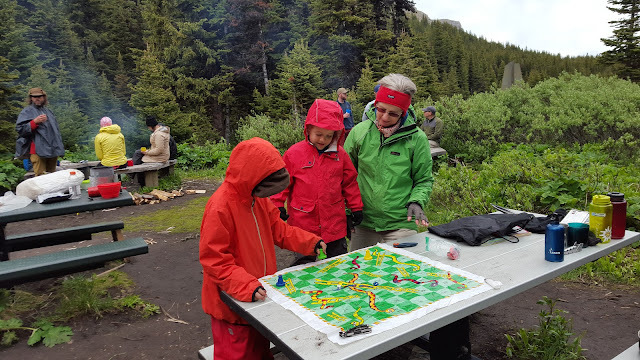 Bring a favourite game along or make it a family tradition to buy a new game each summer for the season's camping trips. For many people, camping is all about sitting around the campfire with a beer in hand, reading a book maybe, or playing endless games of scrabble and crib. Once you have kids though, the days of relaxing in your camp site are over. Your kids want to be kept active. They want to move. Below are the best ways I can suggest to entertain the troops while camping, from the toddler to the teenager. Child sized lawn chairs (my son used his to eat off the picnic table benches) - alternately, see photo below for how to use a booster seat when camping. We always bring lots of books with us when we go camping. We choose books our son can read by himself that have sound panels or some other interesting feature so that he can read in the tent before bed by himself or occupy himself quietly while we are busy with camp chores. For other down time ideas, consider sticker books, colouring books, play set books (we have a Thomas the Tank Engine play set that comes with a fold-out map and little trains to play with), or crafts. Go with friends! A child who has a friend to play with will be content to run around with their friend all day long (especially if they are old enough to go to the playground or ride their bikes around on their own). Meanwhile you can hang out at the campfire with the other adults and enjoy some quiet time. If the kids aren't old enough to play on their own, parents can take turns doing playground duty, accompanying the kids on bike rides, and supervising scavenger hunts. Another thing that we discovered on a backcountry trip is that pre-teens and teenagers make excellent buddies at camp! They might not be formally babysitting your younger children but they can certainly take a gang of tots to the playground or organize a game of tag. Most toddlers love older children and will want to follow them around all day. Do you have any other suggestions for camping with toddlers and preschoolers? Next in this series on Family Camping Made Easy: camp hygiene and bathing. You always have such amazing pictures (on top of great info!) Thanks for the mention. Thanks Jen. I'm certainly no professional photographer but it's a fun hobby. I've been working on my photography since I started writing because I realize that the photos and stories go hand in hand. Lots of great suggestions here. Would you believe we are taking our first road trip this summer, which will be chock full of camping adventures? Hope to have much more advice come September. :-) Thanks for the shout out. Lots of great camping information! Thanks for the shout out. Thanks Tiffany and you're welcome. You are so making me miss living in Colorado . . . sigh. Great article. This is awesome! Thanks so much for including me. We are taking our first backpacking trip with the girls this summer and everyone is super excited. A lot of the packing will have to be cut down since our youngest will still need to be carried some of the way...should make the camping part a bit more interesting when we don't have some of our fall back favorite toys along! Just means mom and dad will have to get more creative. You're welcome Abbie. You have many good suggestions and activities. I'll be writing a story soon on backpacking. Love all your suggestions here! We overpacked toys for the first couple years for our two boys. Finally when they spent a whole trip playing with an empty coffee can, we gave up and pared back. My boys (4&7 now) love their lightsabers and we always bring bubbles. Plus I pack a small bag for each with a pad of paper, some colouring sheets, activity sheets and a pencil case for each with pencil crayons, highlighters, stickers, post-it notes, etc. They add some of their favourite books, and it comes in very handy on a rainy afternoon in the tent! (So does the iPad with some new movies!). Glad to hear that others bring movies too. It's been recently suggested that anything of the sort doesn't belong in nature. I figure whatever it takes to keep the little ones calm and happy along with a healthy dose of running, climbing, exploring, and hiking. Thanks. I plan to write lots more about camping again this summer and if you look back on my posts last summer from May through September, you'll get an idea of our fav. campgrounds in the area. We car camp with 6 under the age of 12! 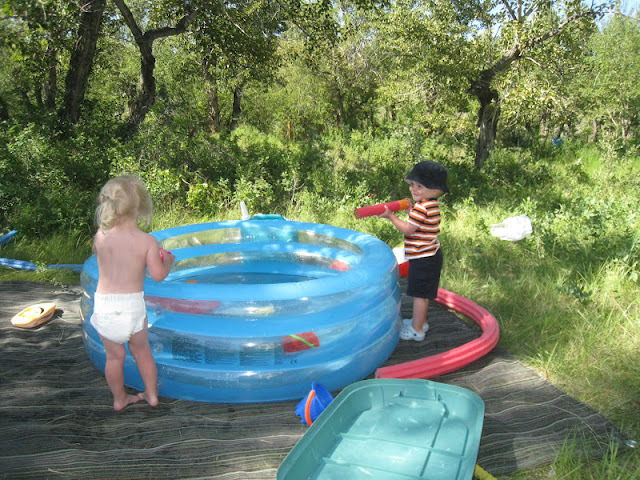 Last year I found that the totes I hauled the food to camp with made great water play and bath tubs for the toddlers. In the picture of a dad reading to his three little ones, 15 of the 19, what tent is in the background? It is grey and kinda a burnt orange color. With our second one on the way we are needing to upsize a little for next years trip and need the vestibule on the front for the dogs. Love reading your posts!! Makes me wish I'd been a bit more adventurous, and mobile, for this year's family camping trip to the mountains but at 8 months pregnant I chose some pretty safe campgrounds where the car was never too far away. I feel quite proud of myself for tenting and our 17 month old loved it even more this year than last. The one bonus to being very pregnant is that I was never cold and kept everyone toasty warm in the tent at night. Actually, this is the link to the exact tent we have. Ours is a little different than the current Astro 3 but pretty much the same. Hi Jennifer, I'd suggest you contact Jen with the Axel Project. They donate Strider balance bikes to families who perhaps can't afford them. There are large Strider bikes that are designed for kids with disabilities. They are larger for the older kids who require a simple bike that doesn't have pedals. If you are from Canada, please email me directly and I will see what I can do from my end. I have a few connections here. My address can be found on the "contact me" tab of this page. I Can not explain.How much beautiful pictures i have ever seen in the past 2 years. Actually I really like the way you guys have planned everything to make that family camping so amazing. Like the images and looking forward to arrange a similar campaign with my family as well. Thanks a lot for a nice contribution. It was such a informative and great writing and writer, you have done an excellent writing here. It was full of information, you describe everything very clearly and here have some information which is very useful for family tour. This is really an awesome post for adventure loving people. Many of us think, “Oh, My children is growing up. I can’t go along with my kid” They normally think that camping or outing literally ends after a little kid. So after reading this post, the thoughts will change for them. Love all the suggestions that you given below. Because I found each and every suggestions very supportive. Specially the sizable chairs, tables etc are one of the best. So, it’s time to make camping with my kid! i just love camping! thank you! We usually didn't camp if it was colder than maybe 5 degrees Celsius at night. Sorry but I'm not sure. I'd recommend going to an outdoor store and taking a look around. Many outdoor companies sell similar items.